Researchers from Stony Brook University Medical Center in New York confirmed that the Hobbits, or Homo floresiensis, are indeed a separate “human” species instead of a population of diseases Homo sapiens. The 7th Human Evolution Symposium, Hobbits in the Haystack: Homo floresiensis and Human Evolution was held this year at Stony Brook. A recent full-body reconstruction of LB1, the ‘little lady of Flores’, by the Parisian paleoartist Elisabeth Daynès. (©2009, S. Plailly/E. Daynès—Reconstruction Atelier Daynès Paris). 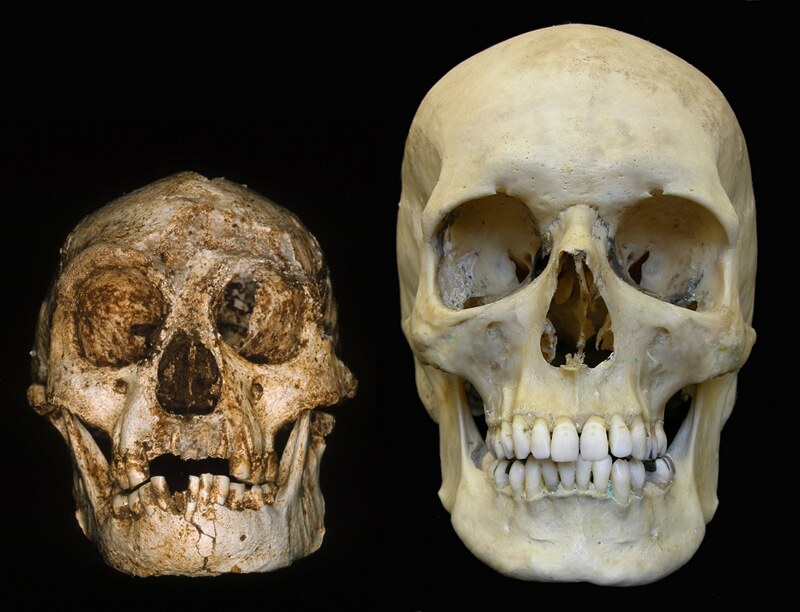 Photo from The geometry of hobbits: Homo floresiensis and human evolution. 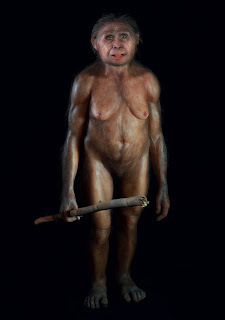 According to the press release, researchers William Jungers and Karen Baab used statistical analysis on the skeletal remains of LB1 (nicknamed Flo) to determine that Homo floresiensis are indeed a distinct species. A few characteristics of LB1 that makes her and her kind a separate species than modern humans. LB1’s cranial capacity is about 400cc, about the same size as a chimpanzee. The skull and jawbone of LB1 is more primitive looking than any normal modern humans. 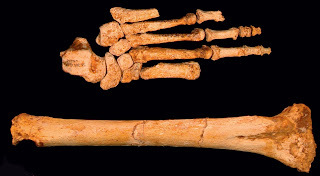 The thigh bone and shin bone of LB1are much shorter compared to modern humans including Central African pygmies, South African KhoeSan (formerly known as ‘bushmen”) and “negrito” pygmies from the Andaman Islands and the Philippines. Jungers and Baab believe that these are primitive retentions as opposed to island dwarfing. Using a regression equation developed by Jungers, LB1 was about 3 feet, 6 inches (106cm) tall, far smaller than modern human pygmies whose adults grow to less than 4 feet, 11 inches (150cm) tall. The nearly complete left foot of LB1 next to the right tibia (shin bone, which is ~235 mm long). 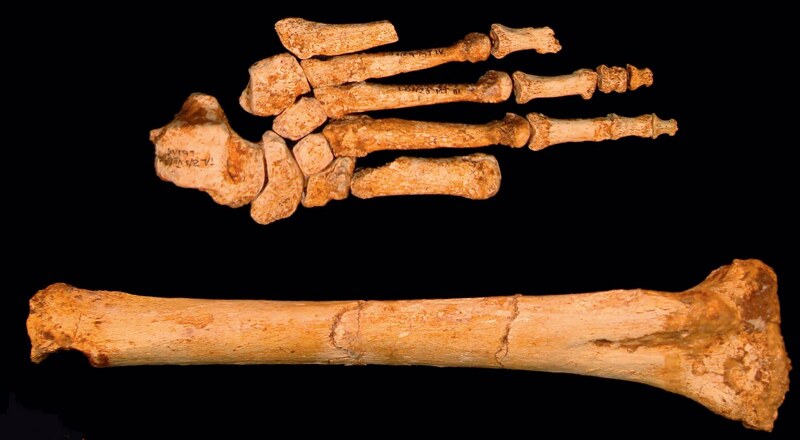 The foot is relatively very long and has unusual intrinsic proportions; its footprint matches no other species (photo: W. Jungers) The geometry of hobbits: Homo floresiensis and human evolution. 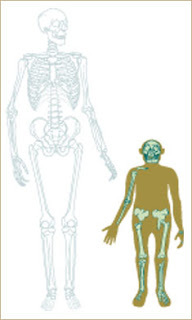 Read more about the Hobbits at The geometry of hobbits: Homo floresiensis and human evolution (Free Wiley Interscience PDF). Any information about their hyoid bone? Hi ebbolles. I don’t think they found the hyoid bone. On page 3 of http://www3.interscience.wiley.com/cgi-bin/fulltext/122688405/PDFSTART?CRETRY=1&SRETRY=0 is a picture of what was found from LB1. “confirmed that the Hobbits, or Homo floresiensis, are indeed a separate ‘human’ species”. It amazes me that anyone still needs convincing. Has anyone ever compared the Hobbit people Aetas of the Philippines? I believe that part of the world, was first populated by the negrito people, and that these people(hobbits) are related. I also believe that the Hawaian mith of the Menehunes, was based on actual people (Negritos). These people could have been the original settlers of the Hawaian Islands? They may have been assimulated by the later Polenesian settlers??? I very much doubt it. You certainly need very good boats to reach the Hawai’ian islands. The Hobbits presumably didn’t have boats at all. They probably didn’t need boats to get to Flores because elephants made it there as well. I can’t imagine elephants making boats, or even being carried to Flores on them. Same applies to connections between Hobbits and the Aeta. You’ve always needed a boat to reach the Philippines, except for Palawan at times. “I believe that part of the world, was first populated by the negrito people, and that these people(hobbits) are related”. Negrito people are not related to Hobbits, although it’s remotely possible some Hobbit genes survive in some of them. Negritos are almost certainly descended from the same people as gave rise to the people of New Guinea and Melanesia. In earlier times such people lived right across South China and into SE Asia. The surviving Negritos have just been down-sized a little through living on small islands or isolated in the jungle. As for the Menehunes, most people have myths about others before them. People get pushed around, and history is usually told by the winners. To make themselves feel better about replacing those before them newcomers always accentuate the difference and inferiority of the earlier inhabitants. In fact such mythology is used today to justify replacement of populations.